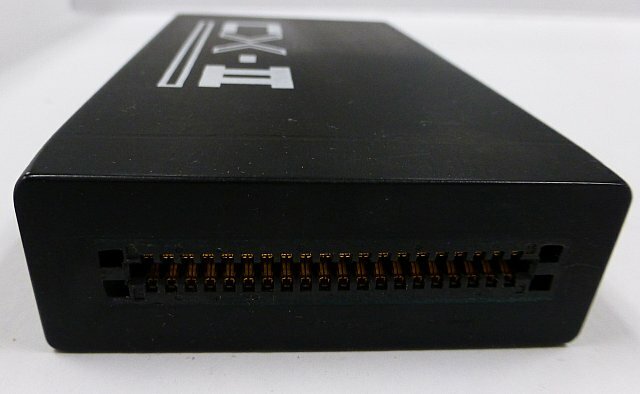 The Cryptext CX-II is a hardware encryption device introduced by the Cryptext Corporation for use in mini and micro computers in 1979. It was originally designed for use in the Radio Shack TRS-801 computer and in 1980 was available for the Apple II computer2 for a list price of $295. Data is encrypted before being stored in memory, on physical media such as disk or tape, or transmitted by telephone lines. The CX-II encryption device has three components. The first is the CX-II unit itself, a molded epoxy brick (1.1″ X 3.0″ X 5.3″ and weighing 1 lb.) which has no exterior lights or buttons. This is the unit that performs the hardware-based computations for encryption and decryption. It has a connection for a 40 pin I/O cable. The I/O extension cable is the second component and attaches the CX-II unit to the Applecrypt interface card, which is the third component. 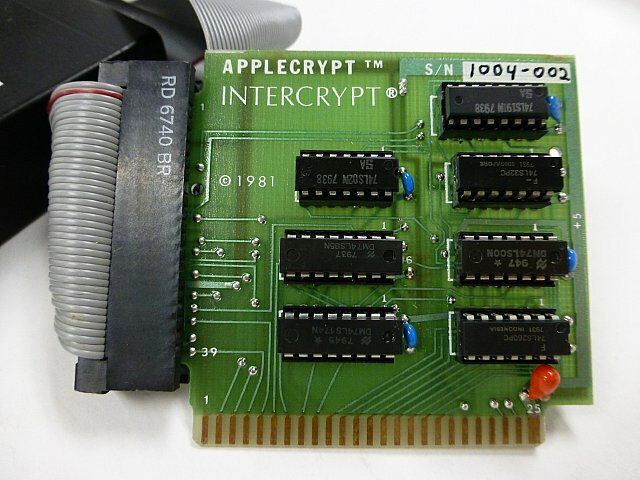 The Applecrypt card was manufactured by Intercrypt and mounts in one of the I/O slots in the Apple II computer, using the standard 25 pin connector. The same CX-II unit could be used with other computers, using the interface card appropriate for that computer. The technology used by the CX-II is a pseudo-random number generator using a proprietary algorithm.3 In the late 1970s, DES was the accepted encryption standard and public key encryption was just becoming adopted. There were also many software-based encryption programs available. 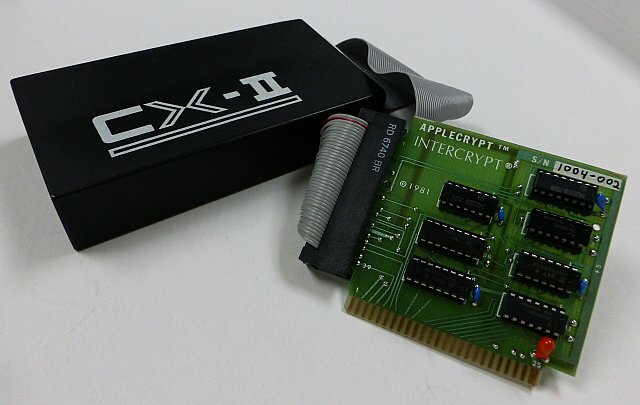 The CX-II was a hardware-based device which gave faster encryption and decryption compared to software-based programs. Cryptext claimed the device could encrypt or decrypt at a rate of 15,000 characters per second, which was adequate for the microcomputers and storage needs of the early 1980s. A full, 5.25″ double-density floppy disk holds 360KB and would take 24 seconds to encrypt. The story is a little better for the transmission of data, since the CX-II was 100 times faster than the typical 1200bps modems of the time, which transmitted only 150 characters per second. The CX-II uses a proprietary algorithm to encipher data before storage or transmission. The key is ten characters in length and chosen by the user to encipher and later decipher the data. A ten character key (80 bits) provides a key length of 280, which was greater than the DES standard at the time, which only had a key length of 256. The CX-II was a relatively robust encryption device for its time and intended use. It was physically protected against tampering or passive detection of plaintext by having all components encapsulated in epoxy. It also used a built-in delay in the internal initialization sequence to prevent “brute force” codebreaking attempts by preventing rapid key cycling3. Also, a “lockout” feature defeats cryptanalysts attempts to derive relationships between the key and code sequences.